I’ve been doing a little computer housekeeping this past week. We had ordered a new computer as our other one was ancient and giving last dying gasps. I thought we’d better replace it and back up the files before I lost everything. Last Friday and Saturday I ended up with lots of time on my hands to purge out some of the files. An electrical storm early Friday morning woke us up and fried out phone and internet lines. No internet kept me from uploading and also getting distracted and made it the perfect time to do a digital clean up. 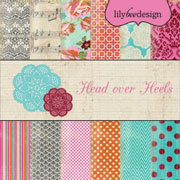 With all this file organizing, I ended up finding a few card designs that I had never shared. 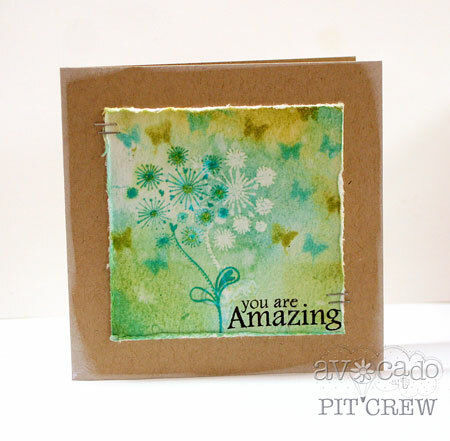 Here’s one using Avocado Arts stamps and a watercolor type stamping technique. To create the background on this card, I started off with watercolor paper and sponged it with lots of ink. When misted with water the distress ink blends beautifully. 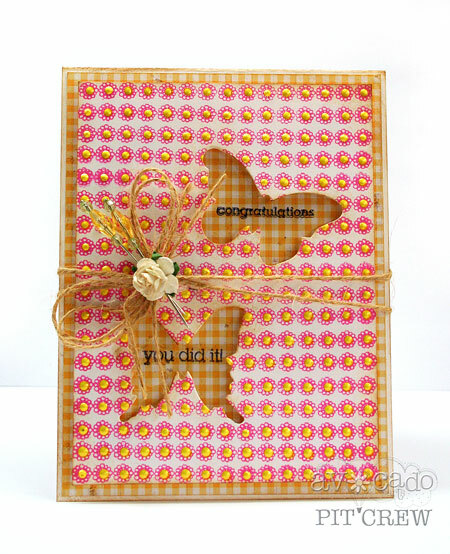 After creating the background, I stamped the butterflies onto the damp paper to make them subtly blend into the paper. The crisper stamped images are stamped after the image is very dry. I like to heat set it a bit with a heat gun to make very sure when I want that final image to make a crisp impression. Now that my new computer is here, I’ve been busy getting it set up and everything installed. 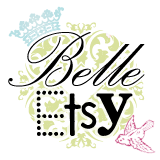 I’m excited to have internet again and once I get caught up, I’ll be back with some new designs. Sometimes simple is all you need. Stamps, ink, paper and one tiny embellishment. 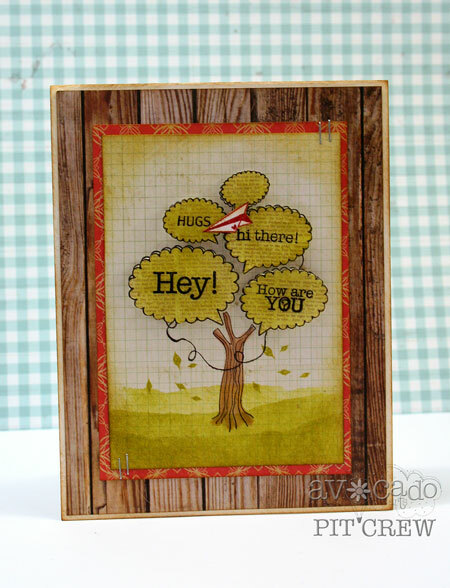 One of my favorite stamp sets from Avocado Arts is the My Wish for You set. It’s a charity set so proceeds from this set are donated by Avocado Arts. It’s a win-win set…you get but you also give. 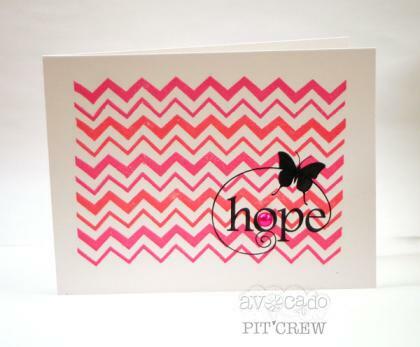 I’ve paired up the simply beautiful hope/butterfly image with a pretty in pink chevron background. It’s made by stamping a chevron border repeatedly in two different ink colors. I admit that pairing up the two different pinks, one warm the other cool, makes for an unlikely pairing but somehow, it works. I think that by stamping in the pinks, this would make a great card for someone with breast cancer. The sad truth is that it seems these days we all know at least one woman who is currently battling this disease. 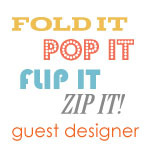 One of the joys of crafting is taking something and putting it together in a fun and unique way. The joy of making it your own. I especially love doing this with stamp sets. Seeing how they can be put together in a myriad of different ways. I love the Avocado Arts stamp sets for this as they all combine so well. Today I’m sharing a card that features the latest stamp set, Stamps and Smiles with a little sneak peek at the new upcoming June stamp set. If you’re familiar with this set can you find the peek? Well, I’ll make it easy for you and just tell you. I’ve made a vase out of the sweet little fishbowl from the upcoming set and the sentiment on the tag is also from June’s set. 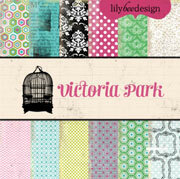 I can’t wait till I can show you the other designs I’ve created with it as it’s a wonderful new set. I’ve always loved still life paintings and did some paper piecing to put this little window scene together. 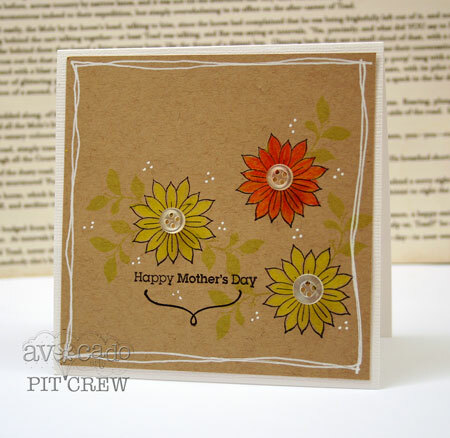 Adding layers of stamping and embellishments helps give it dimension. 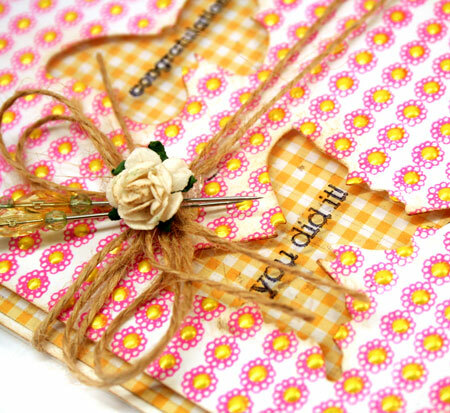 Have you ever stamped on Kraft? One of the reasons I love it so much is that it is a mid-tone color. You can add white or dark to it, and both look lovely. 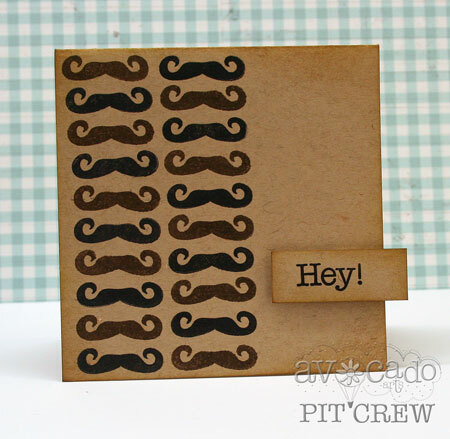 Today’s card features the latest Avocado Arts stamp set, Thoughts and Smiles. 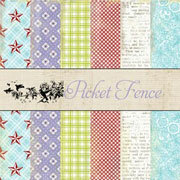 This is a sweet and cheery set, perfect for this time or year. The flowers are stamped and then colored in with watercolor pencils. Yes, these pencils color really well and you only have to add water if you want to. Super flexible. I like that. I’ve also added in some white highlights to make the design pop. A white gel pen makes adding a wavy hand-drawn border easy and groups of three white dots around the flowers fill in the design.